What are the popular places to visit in Idaho? What is Idaho known for? Description : State Map of Idaho showing the state capital, towns, highways, railway lines and state boundaries. The Idaho state spans over a total area of 216, 431 sq km and lies on the northwest of United States of America. The administrative area of Idaho is divided into 44 counties. The Idaho Map provides a clear view of the state highways, towns, railway routes and the geographical location of the capital city. 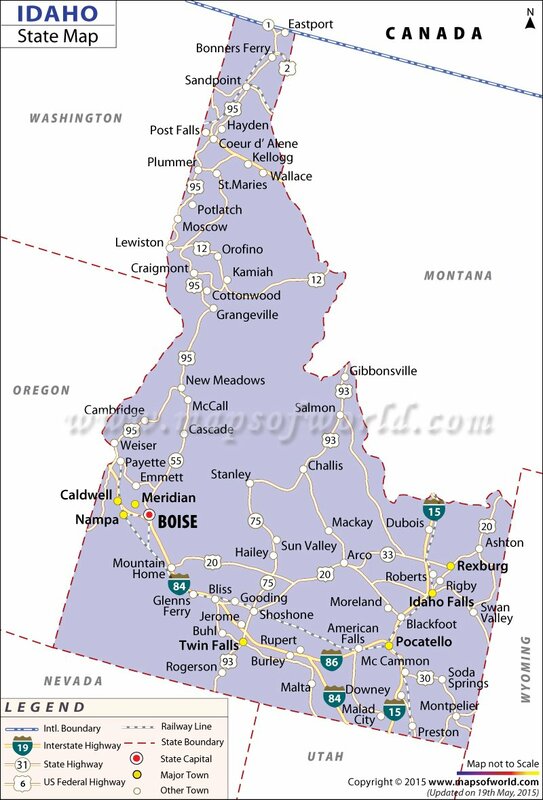 Boise, the capital of Idaho is prominently marked in the map. Interstate 90, Interstate 15, Interstate 86 and Interstate 84 are the major roadways of the state that are highlighted in the map of Idaho. The railway network, which covers the entire state of Idaho, is also vividly shown in the map. Towns which are depicted in the Idaho map include Ketchum, Weiser, Preston, Challis, Cottonwood, Hailey, Orofino, Buhl, Kamiah, Mald City, Rexburg, Moscow, Arco, Rupert, Moreland, Cascade, Payette, Mackay, Lewiston, Burley and Stanley, among others. Montana, Utah, Oregon and Wyoming that surround the state are also indicated in the map of Idaho.